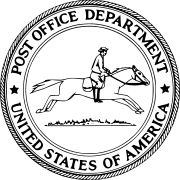 The Post Office Department is the former name of the United States Postal Service when it was a Cabinet department. It was headed by the United States Postmaster General. The Postal Service Act signed by President George Washington on February 20, 1792 established the Department. Postmaster General John McLean was the first to call it the Post Office Department rather than just the "Post Office." The organization became more important in the government when President Andrew Jackson asked his Postmaster General, William T. Barry, to sit as a member of the Cabinet. During the Civil War, postal services in the Confederacy were provided by the Confederate States of America Post Office Department, headed by Postmaster General John Henninger Reagan. This page was last changed on 5 May 2018, at 10:55.